We're at Chu Lai now awaiting the end of the Americal Division change of command ceremony. General Abrams is here and he didn't want any noisy ol' C-130's disturbing his show. We flew from Tan Son Nhut to Chu Lai with some interesting cargo. One pallet contained nitrous oxide--laughing gas (I think that pallet was to cheer up that depressed GI that scrawled "IHTFP" in every bathroom and latrine in Vietnam). One pallet contained money: US currency (green), Military Payment Certificates (MPC), and Vietnamese Dong (piastres). A 463L pallet is 108"x88". How much currency can one pallet hold? I don't know either, but the loadmaster said there was $4,000,000 in green. Why were we transporting all that cash and what was MPC? Vietnamese currency was undergoing rampant inflation, so Vietnamese preferred to hold a more stable currency like dollars, which exacerbated the inflation problem of the local currency. So GI's were paid in MPC rather than green to minimize the number of green dollars in circulation. 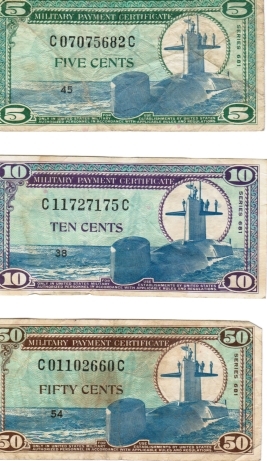 On "conversion day" the old series of MPC would be withdrawn and a new series issued. The date was never pre-announced and on that day you had to exchange all your old MPC for new MPC or it would become worthless. 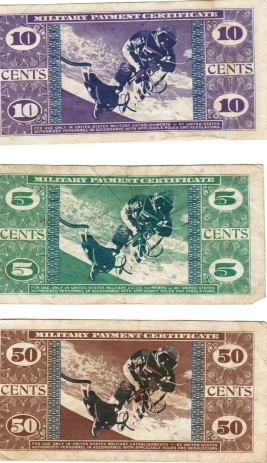 Some bases would not allow GI's to leave the base on conversion day to prevent them from exchanging old for new MPC on the black market. Any MPC held by Vietnamese would become worthless that day, and rumor had it that there were even rocket attacks against bases in retaliation for conversion day. As I started engines at Chu Lai, the #3 starter button didn't disengage. After a couple more attempts we gave up and the engineer tore into the engine and removed the starter. So we did a windmill taxi start to get #3 going, flew on to Hue and Danang, and offloaded our money with engines running. We've been here about 4 hours and it's going to be a while yet. When we arrived the engineer discovered a big blob of hydraulic fluid had squirted out as we shut down. After reservicing and charging the accumulator it still didn't work right, so they replaced the accumulator. About that time the airplane in the adjacent parking spot had a little problem. They were unloading pallets of 20mm ammo onto a K-loader and one rolled off the opposite end and flipped upside down onto the ramp. 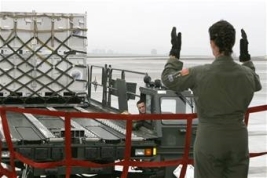 So with 8,000 pounds of class A explosives in a rather uncertain state and many more thousand close at hand, they cleared the ramp and called in Explosive Ordinance Disposal (EOD). So here we sit in the Airlift Command Element (ALCE) with 4 guys playing poker and our crew duty day running low. This poker game is something else--the pot includes green, silver, MPC, piastres, and New Taiwan Dollars.